We were looking at the new coins and notes that are coming in circulation at the moment for last week's Finance Fridays. This week we are looking at how long you have to spend any gift vouchers you may have. In recent years gift cards have become a popular present option especially since they can be bought from a variety of stores now and can be used both in store and online. However many of those gift cards go unused. The UK Gift Card and Voucher Association found in 2014 that around £300 million worth of gift cards went unspent. Many gift cards are lost or lay forgotten in a drawer or bag. Some though will expiry before you get the chance to spend them. A number of high street retailers such as John Lewis, House of Fraser, Debenhams, and Marks and Spencer have a standard two year policy. This is the card will expire if there has been no activity with it in the last 24 months. Activity is classed as spending money, topping up with more funds or just checking the balance. A further two years is then added to the expiry date. Other retailers are much more generous with Amazon giving a full ten years before the gift card expires. Not every retailer gives their customers as long to spend their gift cards. At time of writing the online supermarket delivery service Ocado only gives you eight weeks to spend a gift voucher and no change is given. Other businesses with just 12 months expiry on their gift cards are Hamleys, JD Sports and Ryanair. If you think this seems mean of the retailers involved there is a very simple reason for it. The value of the gift cards are liabilities for the businesses and have to be shown as such on their accounts. In such unstable times for all retailers having a healthy looking balance sheet is essential. Another reason to make sure you spend them is that if a retailer goes bust you may find you lose all your money. When a retailer initially announces it is going to close down it may not accept any gift cards in exchange for payment. Once the business completely closes anyone holding a gift card becomes a creditor. You can lodge your claim but unfortunately gift card holders are a very long way down the list and you probably won't receive any money back. One hope is that the business is bought by another and they will honour any old gift cards. This happened when JD Sports bought Millets and Blacks. Have you got any gift cards to spend? 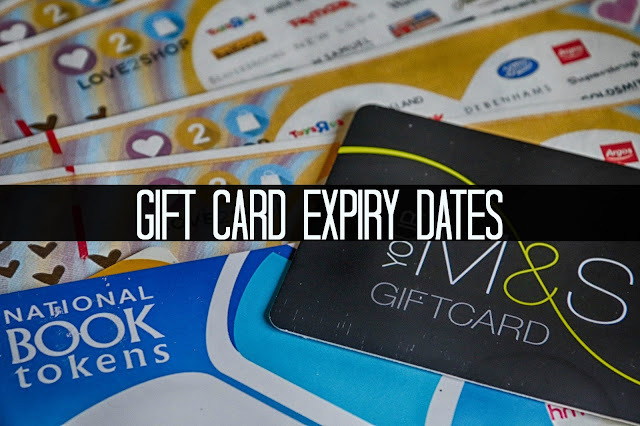 Do you keep track of what gift cards you have? If you want to join in with this week's Finance Fridays then add your link to the linky below. Any post concerning financial matters is allowed. Full details here. It doesn't have to be published today as you have until 23.55 on Tuesday 31st January 2017 to join in. I always check now after being burnt in the past, I always try to spend them quite quickly after receiving them too so not to lose them.